This Magnolia spot is serving some of the best happy-hour fare around. Tanglewood Supreme opens on to what must be the only alley in high-rent Magnolia, harder to find in broad daylight when its neon sign doesn’t shine like a beacon. Fish doesn’t smell fishy. Scallop ceviche isn’t drowning in lime juice. Prawns are snappy and perfectly acidic, served over a bed of couscous, with heat from harissa that’s balanced with candied lemon chutney. Tanglewood Supreme is named after a ground-beef-rice-and-tomato-soup casserole the owner’s mom made for him growing up. But its fare isn’t as comfort food-y as that back story implies, at least since mohawked new executive chef Irvin Diaz came on in February and gave the cuisine more of an Asian bent. Diaz’s happy-hour fried farro plays like fried rice, served with Chinese sausage, shiitake mushrooms with the usual Chinatown condiments, but fancied up with a tempura poached egg. 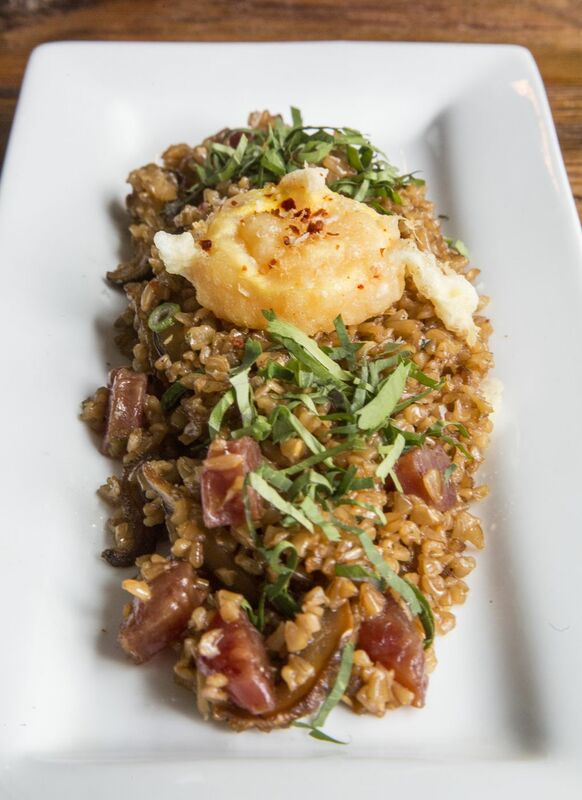 Poke and let the yolk seep into the farro for an oozing, chewy bite, this spot’s best happy-hour dish. Tanglewood Supreme, obviously, isn’t your PBR-chicken-wing-kinda-hangout. It doesn’t even have a bar area. The blond-butcher-block area doubles as such, with folks ordering $8.50 Old-Fashioneds and small plates that are some of the best $5-$6 deals around. Tanglewood Supreme has the smallness of an East Village bistro. But the touches — nautical cleats doubling as coat hangers — hint at the nearness of the Sound. The crowd was retirees and young professionals, locals all, many nodding or eyeing other parties in acknowledgment. Tanglewood Supreme, 3216 W. Wheeler St., offers happy hour Tuesday-Saturday from 4-6 p.m. with small plates and appetizers and $1 off on selected beer, wine and cocktails (206-708-6235 or tanglewoodsupreme.com).